What are your themes this year? Last week when you wrote, arted, or thought about your longings, did a few themes come up? Are there certain areas of life that are pulling at your attention? Are there certain life opportunities or life commitments that need significant attention from you this year? When I’m talking about this year, for me, I’m really talking about the next few months. I’ve done yearly planning or yearly dreaming for a whole lot of years, but the reality is that I don’t think I’ve ever followed my January plans in December — life for me has never been quite that predictable. Usually only a few months are visible in front of me. YET, if I’m intentional about these next few weeks or even these next few months, I’ll find myself in situations where new possibilities arise that I never could have known about now. So, I’m setting direction! Join me? My themes or focuses for this year are Hearth and Home Tending, Study, Painting, Blog and Teaching, Red Thread Sessions, Nurturing Liberty (in my son and in others), Silence, and then a later addition that screamed to be included, my Body. Other years included very different themes, such as “Research Home Education”, “Explore and practice Freezer Cooking”, or “Study Joseph Campbell”. One year the whole theme was basically “Survive Toddlerhood”. Do you know all you long for in this coming time? On Fridays, I’m going to include an art journalling post, some ideas for arting, writing, or just pondering. I had such a positive response to my 60 Days of Journalling that I wanted to continue in some way. Hopefully, you may find that you have some time over the weekend to play and ponder with colors in your hands —- and create a visual memory of your life. Join me! Think about how you want to BE, FEEL, or what you want to DO, in the three main areas of your life: your own SELF, such as your health and fitness, your spirituality, whatever you would call YOUR “deep and real’s”, your learning and education this year, how you express your creativity, whether or where you want to travel, etc. ; your FAMILY, such as your “inner” family — those whom you live with, your “around” family — those friends and family you interact with on a regular basis, and your “extended” family — whether genetic or chosen family; and your COMMUNITY, such as what activities outside the home you are engaged with, people or groups you influence, or any new groups you might want to be part of. Remember, this is not a list of “shoulds” or “oughts”. This is an inventory of what within you longs to be explored and expressed in some way. For heaven’s sake, do not make this another list of things you have to get done! Here are a few ideas of how you can put this on paper in colors: you can make a grid, with “Be, Feel, and Do” going up and down vertically on the left, and then with “Self, Family, and Community” going across the page at the top. Draw the lines out to create some boxes, and fill them in point form. Now if you’d rather be out of the box, you can draw and color in either three or nine large circles across your page(s). In each of the circles, do a free write about how you want to BE in regard to your Self, Family, and Community. Do the free write around the inside of the circle, making a spiral towards the center, moving your page around completely as you write. You can always draw more circles if you run out of room. Or, have one circle for how you want to Be in regard to just your Self — there you would fill nine circles. Yet a third option would be something I learned from Heather Plett: create a large (about 7 inch diameter) circle on your page, then outline your non-dominant hand within the circle. 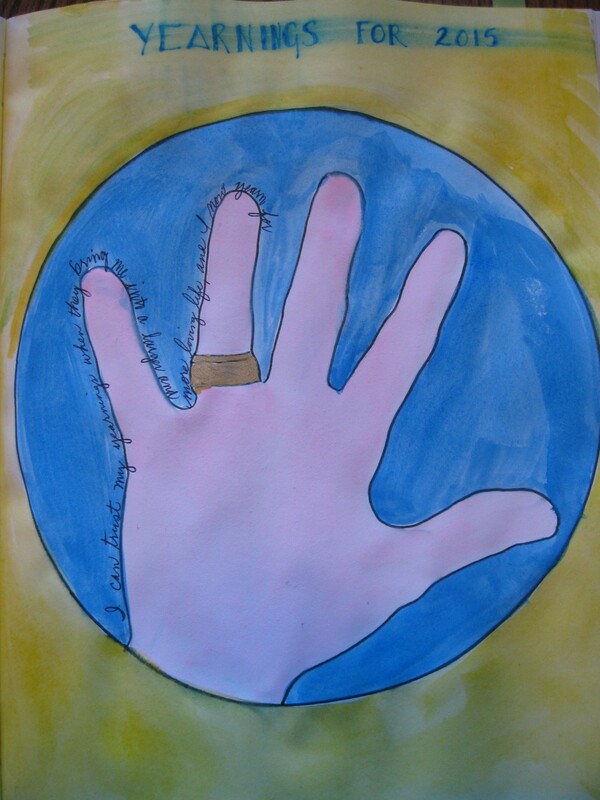 Add colors as you want, then free write your longings along the outside of the outline of your hand. No need here to cover every Be, Feel, or Do, with all the ways you show up in the world; just write from your heart poured out into your hands. 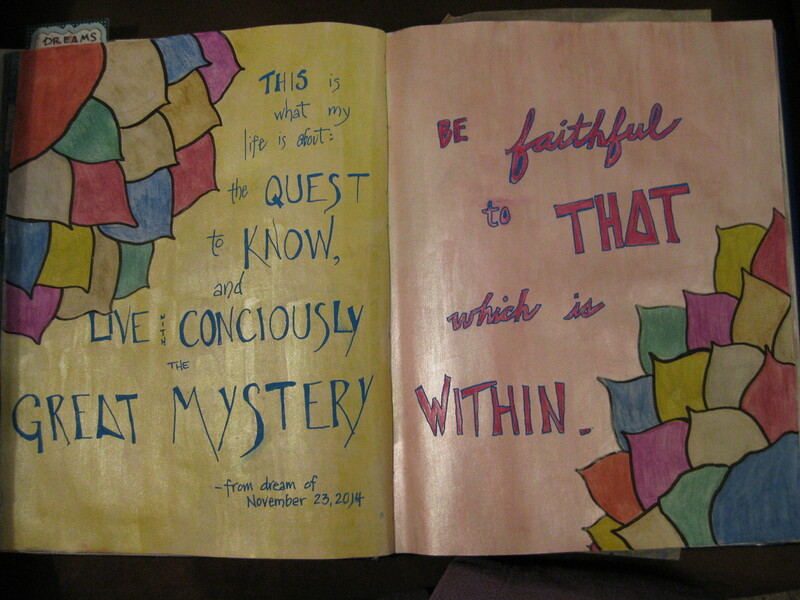 After you finish, nurture the page(s) with a little more color. Ask yourself if there is more to say right now, or if you were surprised by anything you wrote. Is there anything that you thought might be there that isn’t? All of this is information, information that helps you live your life with more intention and liberty. I’ve been so excited preparing for my Dream 2015 afternoon event next Saturday! It’s going to be a pleasurable, rewarding, and spiritual experience. That day’s session is full, but I have space in my calendar to offer another session if any of you would like to book one —- join with a friend for a large deduction in your investment for the day. Details below! Saturday, January 17, 2015, 1:30 – 5:00 p.m. Imagine what it would feel like to use Intentional Creativity as your tool for dreaming up your best year yet, consciously and joyfully. What will happen when you allow both sides of your brain, the logical language based side and the image filled, colorful side, to speak to yourself and to the world? Join me in a microgroup (2-5 women) using circle, labyrinth, color, imagery and words to let go of 2014, access your longings, and intuitively plan how to make some dreams come true in 2015. You will leave with several finished visual inquiries plus a poster envisioning the circle of the year 2015 interspersed with action steps to bring your dreams to life. We will meet in the Red Thread Study for Depth Dimension Arts in my home in northside Lethbridge. All supplies are provided. Your investment: $150, or if two or more women register at the same time, each will receive a 34% Discount, making your investment $99 each. This is an Introductory Pricing, as my half day workshops are usually $200-$250. Because I work either individually or in microgroups, there is plenty of opportunity for individual customization, attention, and guidance. I am deeply committed to making this work accessible to those who want to participate; if this investment is beyond your means at the moment contact me for work exchange or scholarship possibilities. Cat is an educator, mentor, and counsellor specializing in the exploration of life’s Depth Dimensions, helping people to articulate True Self and make meaning through the paradoxes and challenges that life hands us. She uses Intentional Creativity, writing, dreamwork, and art to help others to grow spiritually and creatively and to recover from trauma, especially sexual violence. A student of the wisdom traditions of the world, she has a Master’s degree in adult Education, a B.A. and 4 years of graduate study in theology, and 30+ years experience, including as counsellor and Executive Director of a sexual assault center. She lives creatively with chronic pain and illness and engages actively in ongoing learning and reflection, most recently with Shiloh Sophia, Visionary Artist, and Dr. Clarissa Pinkola Estes (author of Women Who Run with the Wolves) in both her Mysterium and Original Voice series of intensive trainings. Blessings and love to you in this new year! After 60 days of Journal Prompts (https://catcharissage.com/2014/10/29/announcing-sixty-days-of-visual-journalling-prompts/), are you continuing to art or write in your journal? I keep this in mind during these early hectic days of the new year. My son is back in classes at the college, which has necessitated many actions on my part, including deciphering tuition statements and traipsing from one office to another on campus, standing in many lines, in order to understand just what is needed, and why. This may not sound too noteworthy, except that I get a migraine almost every time I’m in a car, and it’s difficult to either stand in lines or transport my walker through the snow and ice! Flow —– flow. . . . . It’s coming. . .
Are you living your 2015 in the ways that you want to? If not, what stands in your way? Can I help you in some way to live a deeper and more meaningful life? Cat Charissage is an educator, mentor, and counsellor specializing in the exploration of life’s Depth Dimensions, helping people to articulate True Self and make meaning through the paradoxes and challenges that life hands us. 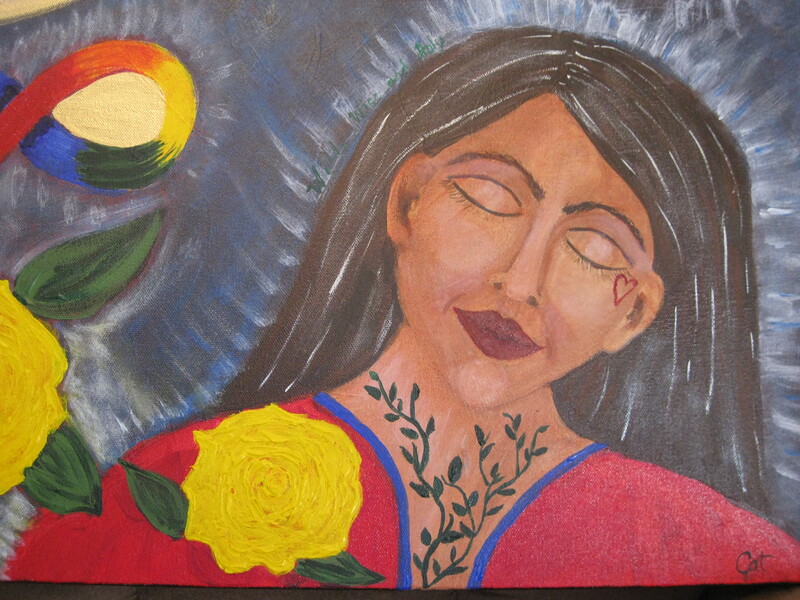 She uses Intentional Creativity, writing, dreamwork, and art to help others to grow spiritually and creatively and to recover from trauma, especially sexual violence. A student of the wisdom traditions of the world, she has a Master’s degree in adult Education, a B.A. and 4 years of graduate study in theology, and 30+ years experience, including as counsellor and Executive Director of a sexual assault center. 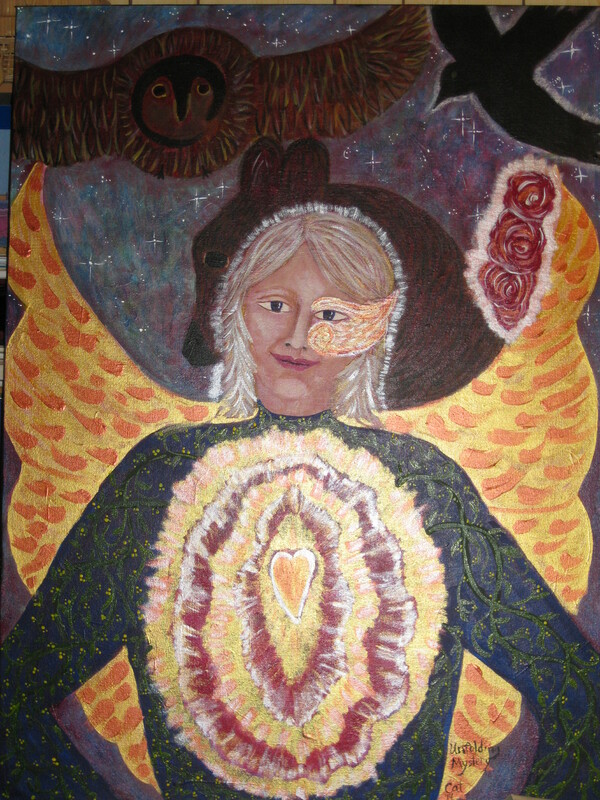 She lives creatively with chronic pain and illness and engages actively in ongoing learning and reflection, most recently with Shiloh Sophia, Visionary Artist, and Dr. Clarissa Pinkola Estes (author of Women Who Run with the Wolves) in both her Mysterium and Original Voice series of intensive trainings.